Russian people are often seen traveling with an only carry-on bag and it somehow makes their travel experience easier in so many ways. If you think about their preference for bringing a carry-on bag for traveling, you will learn that they will not get weighed down by heavy bags. And they will not have to deal with expensive checked bag fees. But, what if you just cannot limit yourself to carry-on only? What if you are just not quite ready to travel with less stuff at your disposal? How can Russian people survive with an only carry-on bag? More importantly what is inside it? What is it they always pack in their carry-on bag? Pretty sure it must have been equipped with necessities as well as must-have items to make their trip a pleasurable one. 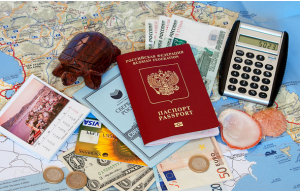 Through this article, let’s take a look at what Russian people usually bring when they are traveling. You may also read 7 Most Favorite Russian Chocolate For Travelers To Bring As Snack Or Souvenirs. It is actually very obvious, but it is worth mentioning. Russian people keep all of their identification in their carry-on bag. Even if they are flying internationally so they have their passport with them. After all, losing any kind of ID card while traveling is not fun, isn’t it? This is especially for those who take essential medications like multivitamin on a regular basis. They do not just pack what they need for their flight in their carry-on bag, put it all in there. If they keep the medications in the luggage or suitcase and only have a day’s worth of it should the luggage get lost for more than one day, they could be in big trouble. They usually take both light layers and warm layers with them. They pack enough clothes to last the length of their trip and make sure do not over-pack because it would be hard to fit everything in their travel bag if they take more than necessary. These two items are like a must for a Russian travel bag. Although they can always listen to music on their phone, they prefer to save the battery to take a picture, make calls or use it for directions at their new destination. Moreover, listening to music is relaxing for it can reduce the noise of other people on the plane and dull the noise of the vehicles. If you ever been kept waiting either because of not being able to board a plane or delayed takeoffs, you must have been familiar with the hunger and thirst you experienced during the long wait. For that reason, Russian people always bring a bottle of water prior to boarding and after going through the security check. Bringing snacks in their travel bag is something they generally do to help them when they are hungry. Moreover, instead of having to stop at some rest areas or drugstores, they can actually save time by putting some drinks, protein bars or fruits in their travel bag. Sometimes, the tiny bag of crackers and a can of soda given to them by a friendly flight attendant just do not cut it, so an alternative you can take is to pack their own. Also, it is certainly a cheaper alternative. No matter how good a phone’s battery life is, it is pretty much safe to assume that it is not going to have enough juice to get you to the destination. Russian people know this better and so they always keep their phone charger with them in case their phone needs a quick boost. This is essential especially if all the information they need to get from one point to another is saved in their phone’s database. Adding to that, there must be times when you do not have access to a socket but really need to charge your phone or camera. A portable power bank is a solution to this problem. That is way Russian people will also have a small portable power bank for easy phone charging. Travel towel has come in handy for a traveler in many ways. Russian people make sure to pack one and either use it as a substitute for a blanket on an unexpectedly cold trip or throw it over themselves and catch some sleep. They even go as far as to fold it up into a makeshift pillow or throw it in their beach bag and wear it as a sarong. Or, living up to its initial usage, they can use it to dry themselves off after a good shower. When they are traveling to a country with a different socket outlet, they bring a universal adaptor with them to use any of their chargers or plugs. This is important for someone who likes to travel to lots of different countries all over the world. With a universal socket, they can save themselves any hassle. Some of you may prefer a waterproof jacket to an umbrella. While a waterproof jacket can be very useful in a cold climate as a rainproof item, but in a hot climate not so great. Not just for traveling, Russian people even bring their umbrella anywhere and anytime. Moreover, if they arrive in a destination that is really wet, they can always buy something locally such as cheap plastic ponchos which are often available to help them to some extent. So, those are what Russian people usually bring when they are traveling. It is not easy to get your head around what you need to pack while traveling. And over-packing is a terrible idea, but with those items mentioned above, hopefully, you can get inspired and also have some insights on essential things to bring when you set up for a long adventure.